As much as I love life in Japan, the pristine orderliness and routine often leaves my soul craving for the vibrancy and spontaneity of chaos found in other places. For myself, India is the perfect antidote. Every visit to this extraordinary land, has been an experience that touches a myriad of emotions, in a way that challenges an individual like nowhere else. India has a diverse population of one billion, that consists of both a massive rapidly growing bourgeois, as well as people living in poverty on a scale that is hard to match anywhere else. Out from these contrasting ways of life is a society that simultaneously exists in a multitude of realities. With such extraordinary variance, it is surprising that any kind of semblance of order can be achieved. And yet, India functions as it has always done, through local ingenuity. Perhaps, the most pervading aspect of the country is the religiosity of life there. The majority of Indians are adherents to Hinduism, but other religions, such as Sikhism, Buddhism, Jainism and Islam, have a wide following. For the most part, members of the various faiths have tended to live together peacefully, but occasionally, tensions do flare between the different communities. 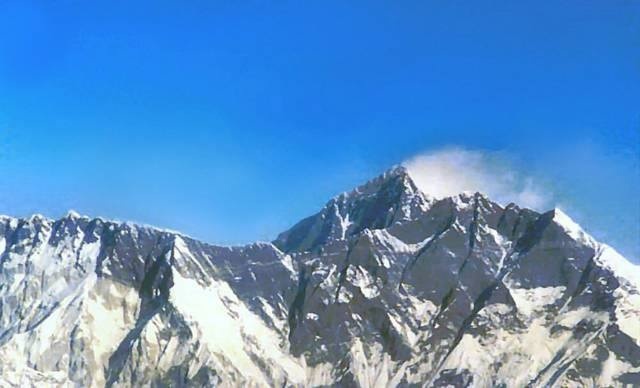 India has always been attractive to those fond of spiritual exploration. Of course, everywhere are the symbols and temples of devotion that one would expect to find. 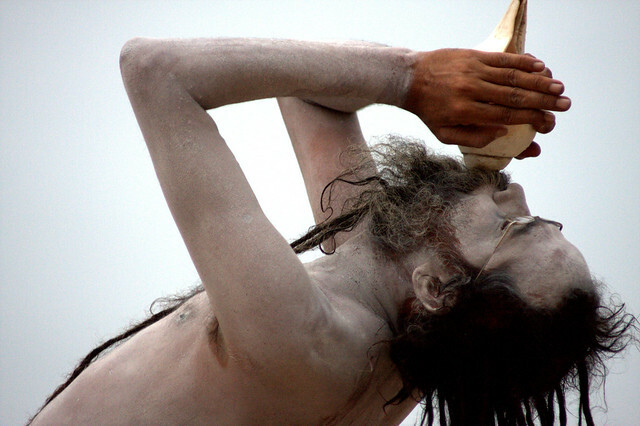 Yet, India’s powerful invocation of the mystical, comes not from these, but rather from the contrasts that are to be found, such as extremes in beauty and ugliness, poverty and wealth, vibrancy and starkness. On every street that is walked, we are forced to accommodate stimuli that are both pleasing and disturbing. It is often said that 50% of travellers hate India, whilst 50% love it. For myself, I very much fall into the latter group. That is not to say that I do not sympathise with the other group’s sense of discomfort, but rather I find the “discomfort” to be part of the wonderful challenge that India presents. India is a unique gift to us all, and should be experienced at least once. When you return back to your home countries, you will be forever changed, and you will never forget the magic of Mother India. On my various journeys, I have come across snakes, whether wild in the jungle, caged up at zoos, or kept in a snake charmer’s basket. Here are a few of my serpent encounters. When I visited Bombay (Mumbai) in India, I stayed at a hotel in Colaba. After a month staying at $2 a night dives, it was a pleasure to stay at somewhere a little more plush. Outside the hotel was a snake charmer, crouching near a low wall. As soon as he saw me, dollar signs must have been popping into his line of vision. Without a second’s pause, he lifted the lid of the little basket in front of him, at which point, a cobra darted up and out of its weaved home. Instead of staying magically transfixed by the pipe of the charmer, it obviously saw a good chance to escape its humiliating circumstances. As it quickly tried to slip away, the charmer grabbed it by the tail, forcing the snake to do what it does best in such situations: BITE! Repeatedly, the snake tagged the charmer’s shoulder to my horror. However, it soon became apparent that the snake had been treated in some way, perhaps having its fangs removed, because the snake charmer just remained calm and did not seem to care in the slightest. The Mystic Traveller gets intimate with a python in Thailand. When I visit Thailand, I feel drawn to see a snake show from time to time. 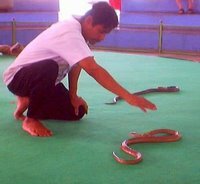 I cannot explain what the attraction is, but there is something fascinating in seeing snake handlers provoke cobras to strike; if somewhat unethical and unnecessary. 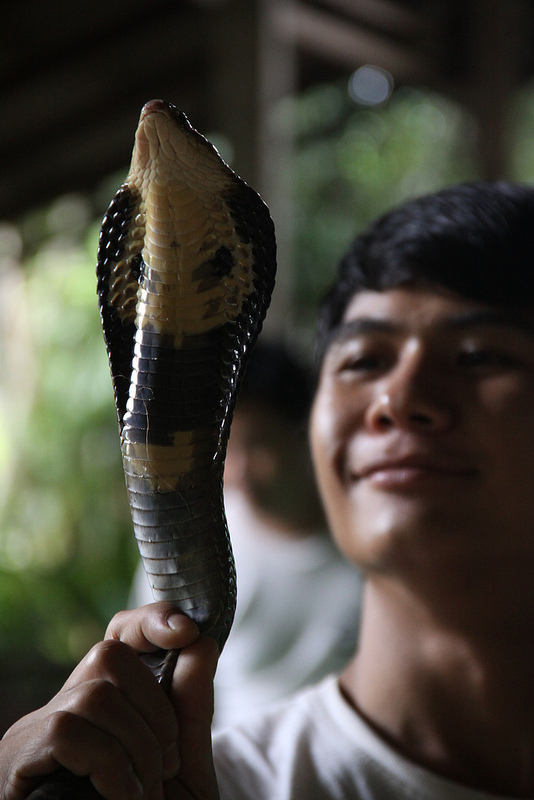 In Bangkok, I have seen several times a show that involves a King Cobra – the largest venomous snake in the world. During one performance, whilst a performer was busy focusing upon another snake, a cobra decided it had had enough of the camera flashes, and obviously thought it would make a swift exit. It was only when the snake started crawling up the audience’s seating area, and people started to move away quickly, did the snake performer take note of his escaping reptile. To everyone’s relief, the truant fanged animal was quickly brought back under control. Unlike the cobra in India, they were clearly still very dangerous; a fact made apparent after a venom-milking demonstration. 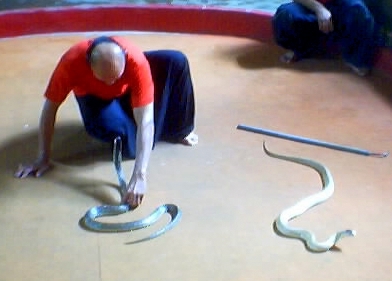 The process involves forcing the snake’s mouth over a rubber bladder, which it punctures with its fangs to release poison into a glass container. This venom is then used to produce vital antivenin for neutralising snake bite venom in victims. When I was night trekking in the Amazon, all I could think about was the Bushmaster, which has the dubious reputation for being highly aggressive and the owner of the largest fangs of any viper in the world. Continually, I watched my every step, carefully following the path provided by my Amazon guide. I flicked my torch light about, catching sight of large bull frogs. Suddenly, on the path ahead, the slithering body of a large snake came into view. In panic, thinking that it was the infamous Bushmaster, I screamed out a warning to my guide. In all my years of travelling, I have never seen anyone jump so quickly backwards at Olympian heights, as he did. To our relief, a biologist that was with us, quickly determined that it was a Rainbow Boa Constrictor; while not venomous, it could still provide a nasty bite with its recticular fangs. However, this did not deter our biologist friend from pouncing upon to it and wrapping it around his shoulders to the horror of our guide. 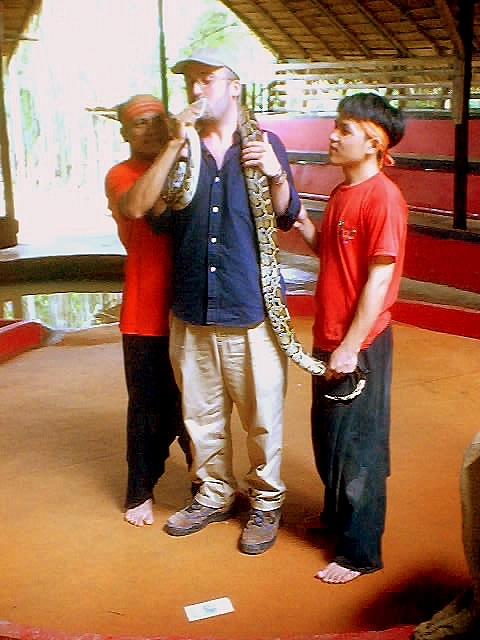 Of course, inevitably when travelling through Asia, the adventurous gourmet will partake in consuming snakes. In China, I have eaten snake several times, in a variety of concoctions, such as snake so up, snake cutlets and fried snake skin. It is a hackneyed comparison, but once you get pass the bones, snake does taste just like a chewier chicken. In Vietnam, they sell a ginseng wine that has a fully-hooded cobra within the bottle. The snake’s venom glands are obviously removed, but it makes for a pleasant drink. The Vietnamese sell souvenir bottles at the airport in Ho Chi Minh. However, any traveller who chooses to purchase one of these, should be aware that it may well get confiscated by Customs on arrival at most international airports, such as Heathrow or JFK. When I was in Vietnam, there was government moratorium in place to stop the trapping of wild snakes for food, because the rodent populations had now got so out of control that farmers’ crops were being severely damaged. We have very good reasons to be wary of snakes, but they fear us more than we fear them. They deserve our respect, as they have always done. It comes as no surprise to find these magical reptiles being central in so many of the world’s cultures, whether in the mythology of the ancient Egyptians, the Maya and Aztec, the Aborigines of Australia, the Buddhists and Hindus of Asia, or in the Edenic stories of the Jews, Christians and Muslims, alike. Snakes will continue to always be entwined into the human psyche.